This is a post written by Jeannette Fackler. Jeannette and her husband Aaron lead a support group at Living Hope for people who are involved with fostering and adoption. Recently, I found myself tearfully asking God, “Why am I here again? Why do I come back to this same place of failure and sin over and over again?” It seemed as if the same old anger, the pursuit of entertainment, and self-centeredness still resided in me. The fact that I was still struggling with the same sins and weaknesses seemed to be evidence of a lack of fruit, a lack of growth. That could only mean that… maybe I wasn’t saved, after all (“A healthy tree cannot bear bad fruit…” Matt 7:18). I was nearly paralyzed in despair. Graciously, our Father reminded me of something I learned in a recent training. It wasn’t the first time I’d heard it. In fact, my husband and I have attended trainings discussing Attachment Theory for the past five years, as part of our foster/adoptive parent curricula. The trainings have become almost as familiar as the ABC’s – I could recite a general summary and multiple applications at any time. I’ve often thought of its effects on my children, how it has manifested in their lives, and how Aaron and I might use it to parent them better. But I’d never once thought of its relevance to me. 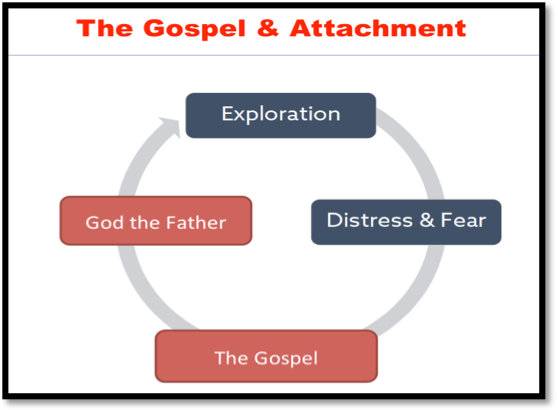 Attachment Theory, as originally postulated by a psychoanalyst named John Bowlby in the 1940s-1980s, was fairly complicated and I won’t attempt to restate it all. However, he believed that during the first two years of a person’s life, it is critical to develop an emotional bond (an attachment) with a caregiver. This bond leads to the creation of a “working model” for how a person views: 1) the trustworthiness of others, 2) their own value, and 3) their own efficacy in social interactions. He believed that the loss of this bond would result in dire consequences – intellectual, social and emotional difficulties. Bowlby’s theories were very influential in psychological research, and they’ve been updated, revised, and rearranged by numerous professionals. The training I mentioned earlier was provided by the Karyn Purvis Institute of Child Development. This group, along with others, often depicts the developing attachment between infant and caregiver as a cycle. 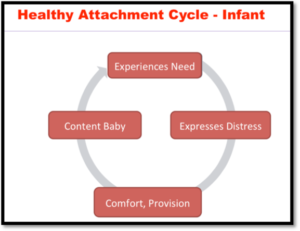 In the first few months of life, the cycle looks something like the diagram below: baby experiences a need (hunger, discomfort, etc) è baby expresses distress (crying) è caregiver resolves the need/provides comfort (touch, eye contact, etc) è content baby. See my diagram below. As you can imagine, this cycle is repeated thousands of times over and creates in the baby a sense of, “I’m safe. There is someone taking care of me.” As the infant develops, this sense of safety carries over into their exploration of the world. If they have a secure attachment to their caregiver, the attachment cycle begins to look like the slide below, which is from the training I mentioned earlier: Empowered to Connect 2018. The child’s attachment to their caregiver becomes a secure base from which they can operate. The child begins to explore the world. Exploration inevitably leads to distress, which causes fear. Think of a toddler learning to walk. They try a few steps, but then they fall. It hurts, which scares them. Why does it hurt? Is the world not safe? But then the caregiver picks up the child, speaks soothingly, and treats their wound. The child is comforted and reassured. 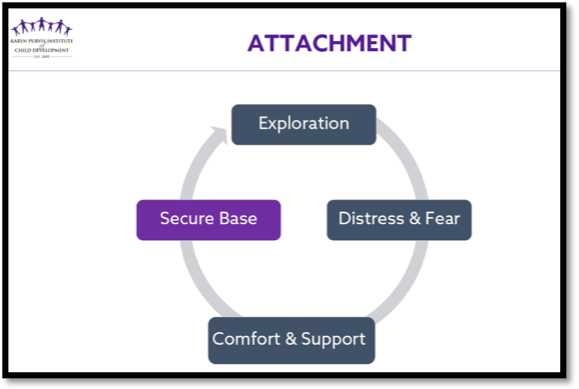 The secure base (the emotional bond with the caregiver) is simultaneously strengthened. The cycle begins again. That’s when He comes and reminds us of the gospel, through the inner workings of the Holy Spirit (John 14:26). He tells us again the story of how He gave His only Son, who knew no evil, to bear our consequence. It hits us anew: He DOES love us (John 3:16). And because perfect love casts out fear (1 John 4:18), we say, “Yes. I remember. I will trust You in this.” Then He takes care of our need, and our relationship with Him is strengthened (Phil 4:19). He sets us on our feet and says, “Go. Try again.” He doesn’t leave. He stays. (Joshua 1:9) For though we fall, when we delight in the Lord, we will not be cast headlong and the Lord will uphold us (Ps 37:23-24). So the cycle begins anew. This is pictured in my diagram below. Even the pain of our sin reinforces the life and comfort we receive from our Father, for godly grief produces a repentance that leads to salvation (2 Cor 7:10). This, in turn, produces in us the effect shown in Galatians 5:16-17, where we walk by the Spirit and will not gratify the desires of the flesh. Trust develops, dependence develops, and we develop at the same time. Please don’t misunderstand me. I don’t believe for one second that God causes us to sin, that we should purposely sin, or tolerate sin. Purposely sinning, betting on forgiveness later: that would be me trying to control my life – and never getting any closer to relying on God. You can’t cheat God, and you can’t fake a relationship with Him. According to Galatians 6:6-8, God will not be mocked, and if you sow to your own flesh (i.e. purposely sin) you will reap corruption. He knows if you’re really coming to Him in trust and submission, showing Him your pain and asking for His help. That’s what He wants – your full faith, your undivided love, your unashamed expectation of His providence. Those same verses in Galatians call this “sowing in the Spirit.” Nothing less will do. Thankfully, Isaiah 43:2 says that when we pass through the waters, God will be with us. He takes us through this and doesn’t allow us to be overwhelmed or overcome. And on that precious day, when we meet Him, we won’t have any doubts. Even when the record of our lives is read, and we are pierced with guilt over all the times we hurt Him in our sin… we will know for CERTAIN that He loves us and that we will live with Him forever. We’ll know because we’ll know HIM. He will have picked us up so many times, held us close, told us about our big brother Jesus, that there will be no question. We will know our Father. Thanks for sharing. Thanks for putting yourself out there and tackling this issue and then sharing how God moved. I do have a question. When is your book being published?